I have ceased blogging in real time as I read Donald H. Wolfe’s “The Black Dahlia Files: The Mob, the Mogul and the Murder That Transfixed Los Angeles.” Wolfe uses the “Laura” format, in which the anonymous, butchered body is found and the narrative proceeds in flashbacks.Now, I am taking a few requests before wrapping up the project. Today, we’ll look at Pages 277-281 at the request of Mary Pacios. Wolfe claims he had an insightful 1962 conversation with Herald City Editor Aggie Underwood during a cruise on the Queen Mary. The only problem is that Wolfe says he was “on hiatus” from “The Loretta Young Show,” which went off the air the year before. And 1962 happens to be the year the Herald-Express merged with the Examiner, so as city editor, Underwood had to deal with joining the two reporting staffs and a threatened Guild strike. And she received an award in Denver in June of that year. Unless I see ticket stubs and pictures of them together, I won’t believe it. And Wolfe goes into some mumbo-jumbo about how Norman Chandler of The Times was best friends with Arthur Lake (you’ll recall Lake has a major role in John Gilmore’s “Severed,” although in reality he didn’t know Elizabeth Short because—as we find in the district attorney’s files—Elizabeth Short wasn’t in Los Angeles in 1944 or 1945). And that Norman Chandler was the best man at the wedding of Lake at—Hearst Castle. I would love to see pictures of Chandler hanging with rival publisher William Randolph Hearst. Don’t miss the rehash of the fake story about Mickey Cohen’s weapons for Israel scam. Or the Leslie Dillon affair. And then another slam on Dr. Leslie Audrain. In fact, let’s revisit the Leslie Audrain saga. Now our only source for Audrain being an abortionist is the self-published book “Thicker ‘n’ Thieves” by disgruntled former Police Sgt. Charles F. Stoker. Recall that Stoker was accused of trying to shake down a convicted abortionist (Eric Kirk, a chiropractor). Recall that he had an affair with Policewoman Audre Davis, his decoy who is the only source for any claim whatsoever that Audrain was offering abortions. Davis said she went to Audrain’s office and talked to a nurse (she never came within a mile of Audrain, apparently). Stoker says that an unidentified supervisor of the medical board’s investigators unexpectedly came back from vacation and learned about Stoker’s sting operation. Stoker says that when he and Davis went back for the appointment, Audrain’s office was…. In fact it was locked all week! The locked office, therefore, is conclusive proof that the medical board supervisor tipped off Audrain. And proof that Audrain was an abortionist. And let me interject a little something about the local investigators for the state medical board in the 1940s. They are not anonymous. Their names were Maynard Youngs, Sterling W. Brooks and Walter Anderson. Brooks was accused—and cleared—of taking a bribe from an abortionist so he could stay in business (Brooks claimed the abortionist stuffed district attorney’s investigators’ marked money in his pocket) and Youngs’ widow was accused of performing an abortion on a 13-year-old girl. (The charges were later dropped for lack of evidence, by the way). Dr. Leslie C. Audrain allegedly committed suicide at his home in Pasadena on May 19, 1949. Now, how does Wolfe know that Audrain was in Room 417? Because that’s not in Stoker’s book. Well he’s going to try to attribute it to this note by Lt. Frank Jemison of the district attorney’s office, and reproduced on Page 274. Apparently we’re only supposed to notice the room number (417) and not the address, 3122 W. 6th St. I swear, the man can’t read what’s in front of him. Take a good look at Jemison’s note. Notice that he has written “3123? And “311” That’s because 3122 W. 6th St. doesn’t exist. But let’s have some more fun (fun being a relative term for a total research drudge). 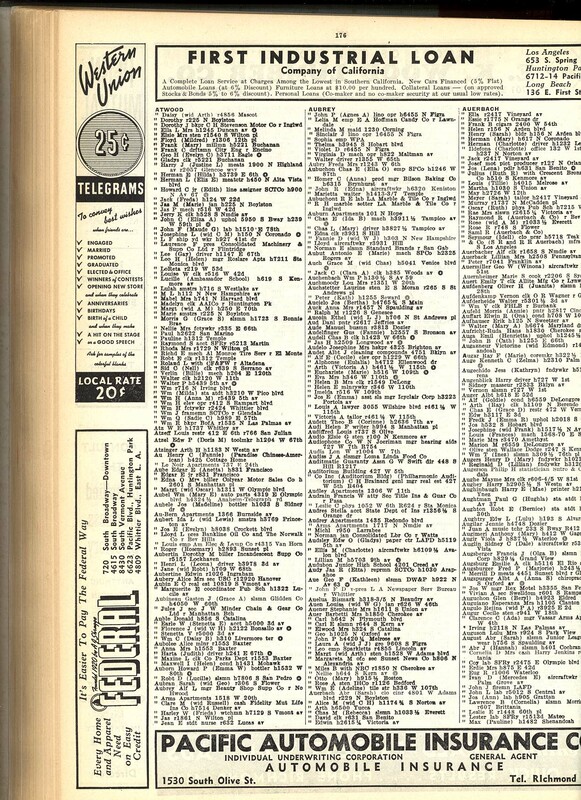 I got out my 1942 Los Angeles city directory and looked up Dr. Audrain. You know what his office number was? Go up to the top of the page and check the scan. What’s this? He lived in Santa Monica? But Wolfe keeps saying he committed suicide at his home in Pasadena. 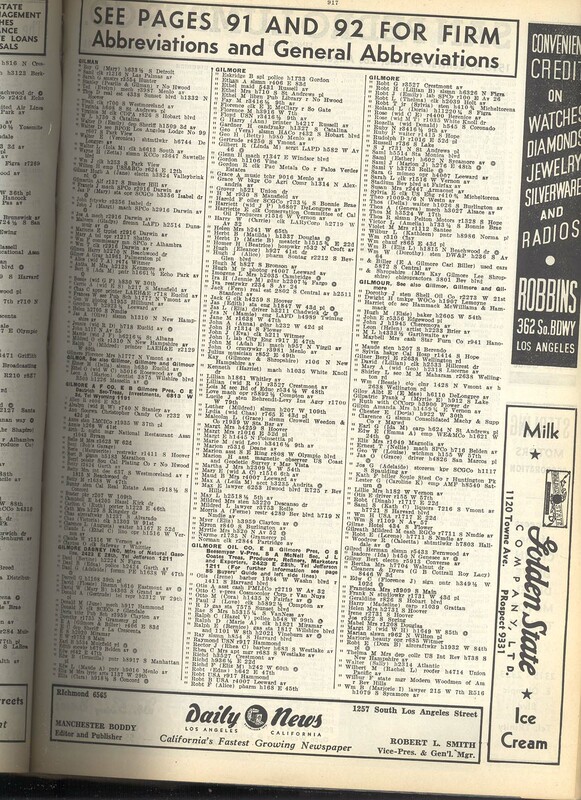 Now while I had the 1942 city directory out, I looked up a couple of other people. 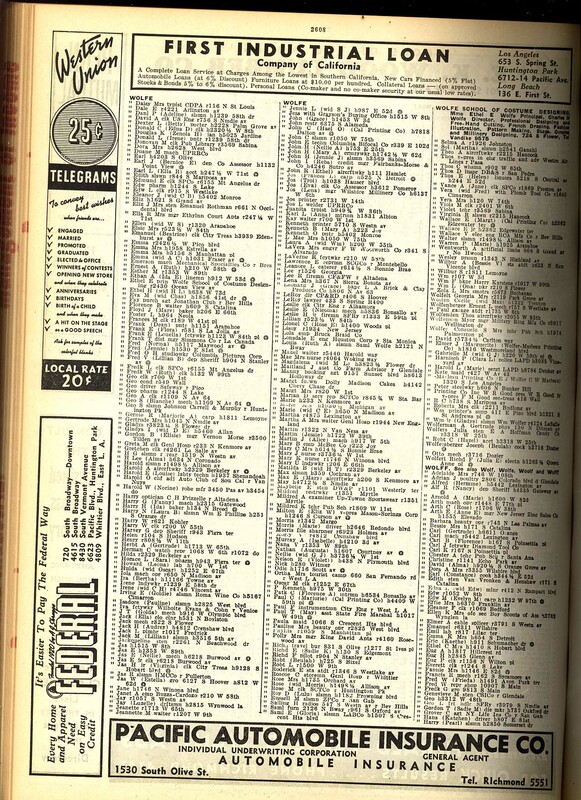 Like Wolfe’s father, Sailing Wolfe, who is never mentioned in “The Black Dahlia Files.” Gosh, looks like he had a radio shop at 547 S. Western Ave. Why that’s less than three miles from what Donald H. Wolfe portrays as Dr. A.E. Brix’s abortion emporium at 125 S. Lake St. And since Sailing Wolfe lived in Beverly Hills, he’d have to go right past it…. Looks like Sailing Wolfe was 3.8 miles from the Biltmore. And 2.9 miles from the Florentine Gardens? Say you don’t suppose…. If I were a different kind of human being, I could get really nasty. And here’s somebody else I looked up. Robert T. Gilmore Jr., father of “Severed” author John Gilmore. Your eyes aren’t fooling you, he’s a crime-busting stenographer. Take a look at that long list of abortion arrests I posted yesterday. That is literally every one I could find over a 10-year period. Notice that Dr. Leslie C. Audrain does not appear on the list, despite Wolfe’s contention that Audrain had a criminal record for performing abortions. Note further that the vast majority of those who were arrested were chiropractors and osteopaths, with a telephone operator, laborer and haberdasher thrown in for good measure. Oh this book. I could just throw it against the wall except it would leave a grease mark. Wolfe is lying and knows he is lying. That’s it for this stupid book today. Lake Forest, Calif. (66.18.154.210) 12 hours!